"A cityspeaker's life is dedicated to others"
Windblade is basically a thank you from hasbro, they decide to run a "create a bot" poll for the fans to create a new character and toys and from that Windblade are born. 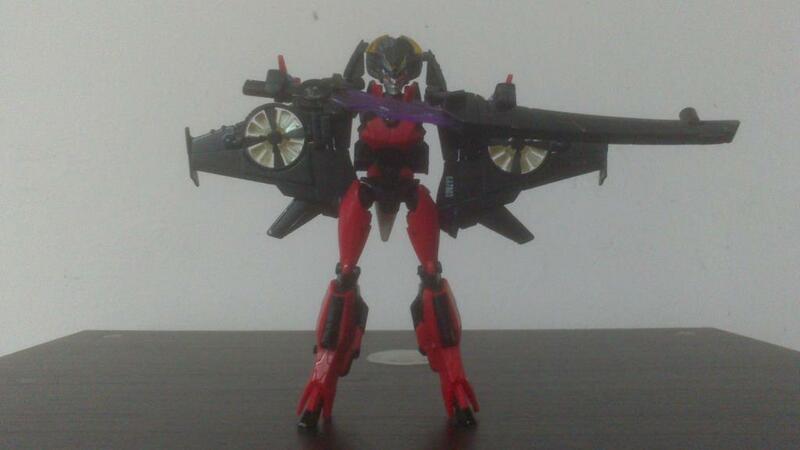 Apparently majority of the transformer fans want a female samurai jet transformer. 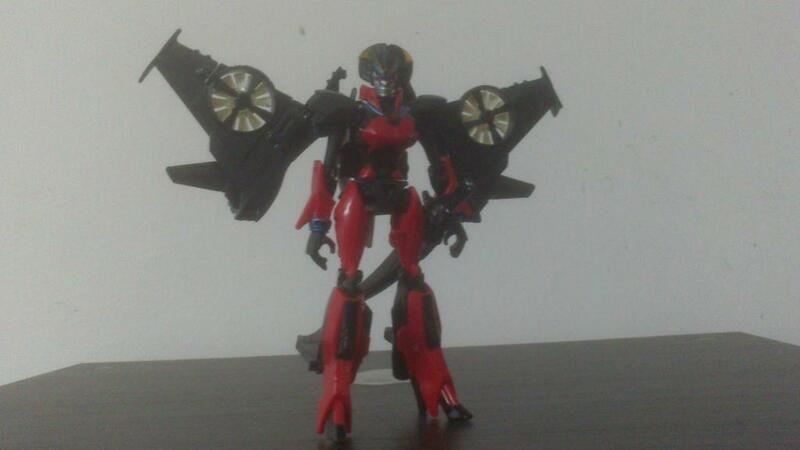 Windblade's alternate mode is a vtol jet, you know those funny looking jet in the movie avenger and captain america 2? yes, Windblade alt mode is one of those jet. 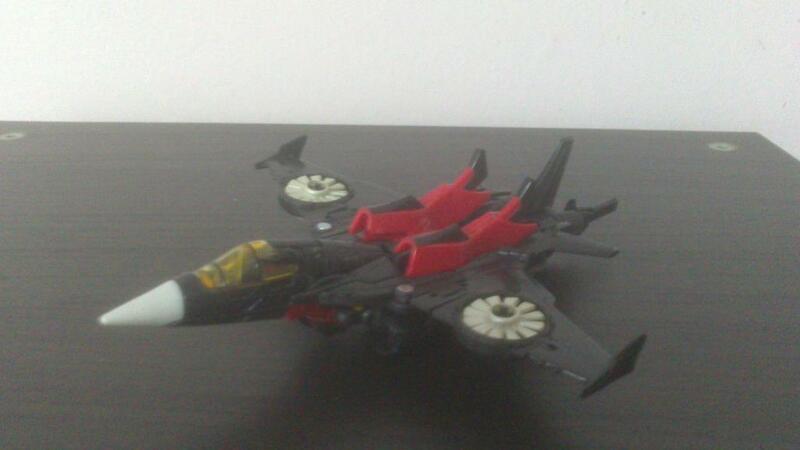 In jet mode, she is mainly black with some red here and there, well black and red is always nice looking. The fans on the wings can be turn front and back, and the fan actually move. that is nice little touch there. In the nose cone, there is a landing gear that you can flip out to complete the plane aesthetic. However her legs hang out on top of the jet isnt well hidden.. i mean it doesnt look like a legs, but once you know its a legs, it kinda stand out like a sore thumb. Under the plane is your usual robot under the plane problem, but its not much just a pair of hand while the rest hidden pretty well. 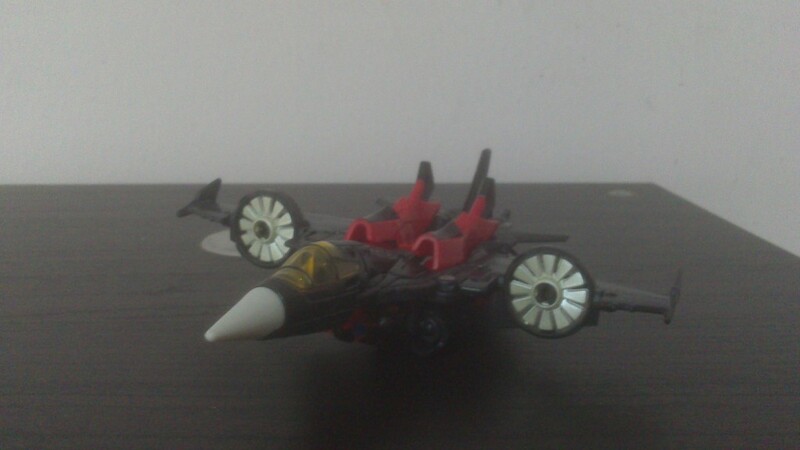 Now the jet mode as nice as it look, its not without problem. it just wont stay together well. Touch this and stuff will un-peg, at least mine have this problem. Another complain is that the center of the plane is pretty empty, you can attach her sword under the plane to hide the hole.. but it look kinda weird from the wide after you attach the sword under the plane. Transforming to robot mode is kinda complicated, but its easy to learn and its very interesting and unique. Its pretty differ from any plane transformer. In robot mode she is mainly red with black, some blue and gold here and there. She look simply gorgeous, especially the head design. The head is very detail and have a really nice paint job, they really go all out with the head. The overall robot mode look great, not many part from the alt mode bleed into the robot mode that look out of place, you know not that differ from your usual jet transformer, some wings here and there. However, she doesnt look as adorable as the Windblade from Windblade series.. maybe because of the art that make that Windblade look adorable. For articulation, her head can look up and down.. slightly left and right.. her head and collar design severely limit her head articulation. Her arm can rotate 180 degree, her gigantic wing prevent her arm from moving all the way. But her arm do move outward, rotate on the bicep, bend 90 degree on the elbow and her hand can rotate. Her leg can move back and fore, outward, rotate at the thigh and bend at the knee, no limitation from the giant wings. She also have a waist rotation from the transformation. Her wings can move up and down and swing back and fore. For accessory, she come with an energon sword with a sheath, i might be wrong, but she is probably the only transformer that come with sword and sheath (normally, they just came with a sword). The sword is quite nice looking, its purple and fading to clear on the tip, the hilt have a fan design kinda look similar to the fan on her wings. The sheath can be hold on the hand or attach on her thigh on robot mode or under the plane in jet mode. Again as nice as she look, she is not without a problem. The main problem is she have high heel and like very high heel figure, she have problem standing, being top heavy thanks to her giant wings doesnt help much. Not only she have high heel, her heel wasnt very reliable because they collapse easily. Her wings and her arm are attach with a single point, so moving her wing will move her arms, luckily the same doesnt apply to her wing because the joint on her wings are tighter. Also due to transformation her shoulder would easily detach from her body because there is nothing connect it to the body, plus the arm and the wing are connected to the same point, so posing the wings and arm can be quite annoying. Transformation Design: 3.5, transformation to robot mode is fairly complicated but easy to learn, however transformation back to jet mode isnt as easy, it took me awhile to figure out and the instruction dont help much. But once you learn it, its fun. Durability: 8, nothing fall out, no joint too tight, its pretty solid durability wise. Fun: 7, her vehicle mode do more then other jet transformer, her robot mode have alot of repay value and the transformation is fun once you learn it. Aesthetics: 7, not quite accurate to the comic except for the comic that is included with this figure. i guess, differ artiest. Articulation: 7, alot of articulation, but some are limited thanks to the design, but its not like you cant pull a dynamic pose, its just more difficult. Value/Price: 7, she is still new, so she should be easily available at retail.. that say, i got mine for a double price from BBTS, but i'm not from US. Overall: 8, Overall she have problem but i would recommended her, simply because she have more good then bad (the only major problem is that she cant stand properly with feminine pose), we kinda designed her and she is quite unique. Plus if she sell well, maybe hasbro will do the contest again. So go out and add Windblade into your collection.